Founded in Coconut Creek, FL, in 2006 by Adam and Alan (Big Al) Costilo, Big Al's Steaks® is a brand that has become synonymous with authentic Philly Steak Sandwiches in South Florida. Big Al's Steaks® serves freshly prepared, high quality, Philly Style Sandwiches and sides at competitive prices. Big Al's differentiates itself from its competitors in the attention to details in the preparation of its products, easy to deliver menus, comfortable Philadelphia ambiance (complete with authentic desserts and beverages straight from the source) and efficient operating systems. Big Al's has positioned itself as the best and only option for truly authentic Philadelphia Steak Sandwiches in the highly competitive QSR sandwich shop market. As we all know the proper selection of a business's location is a vital component to its success. Therefore, we carefully research and select every Big Al's Steals site analyzing factors such as traffic patterns and client potential. Once all criteria are met and a location has been selected, we assist in negotiating your lease and your store's build-out. It is only when you are comfortable with your location, lease terms and marketing area that we move to the next phase of the process – we assist you in the transition to ownership and the start-up process begins. As a result of our extensive training programs, Big Al's Steaks franchisees are trained experts in the Big Al's Steaks operating system before they ever open their own location's doors. A seven day introductory training program (including travel and lodging expenses) at Big Al's Steaks University located at our corporate headquarters in West Palm Beach, Florida where you will learn all aspects of the business such as food preparation and delivery as well as, marketing, advertising, scheduling and bookkeeping. A week of on-the-job training at an established Big Al's Steaks store which allows you to put your classroom training to use. Seven days of training at your store with one of our experienced operations advisors who will assist in your store's setup as well as the implementation of our proven marketing program. Our role doesn't end when you open your doors. As a Big Al's Steaks franchisee, you gain the full resources of our team which is committed to helping you make your store a success through continued training, consulting, marketing, equipment, research and technical support. Join the Big Al's family and experience the satisfaction of owning your own business while enjoying the benefits that come from being part of a growing brand that people know and trust. Call now or request information below to set up a time to speak to a consultant. Interested parties should have at leadt $80K to invest. 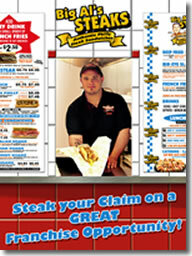 Click on Request Information for FREE info on how to open a Big Als Steaks franchise today! Please Note: This Big Al's Steaks franchise opportunity and other franchise business opportunities, businesses and franchises for sale on this web site are not to be considered as an "offering", "franchise offering", suggestion or recommendation by Franchise Leader™. This advertisement depends entirely on the truthfulness of the information provided by our advertisers which includes, but is not limited to, franchisers, franchise brokers, franchise consultants and business brokers. Franchise Leader™ recommends that you consult a lawyer, financial consultant, accountant or professional advisor before buying a franchise or business opportunity or any type of business. By using this form or any part of our website, you have agreed to all terms and conditions of Franchise Leader™. Please review our Terms & Conditions for more information.